ONION RINGS, BAKED, NO OIL, CRUNCHY! 1/2 tsp all purpose seasoning (I like Everglades) OR 1/2 tsp Creole Seasoning, both are good. 2 Cups Panko or other Breadcrumbs, If you like them real crunchy use all Panko. OPTIONAL 2T of Tabasco, Sriracha, or other hot sauce. Slice onions in large whole pieces about 1/2" thick. Make a *batter of the milk, vinegar, spices, and flour. Adjust flour to give a good dipping thickness, like pancake batter. 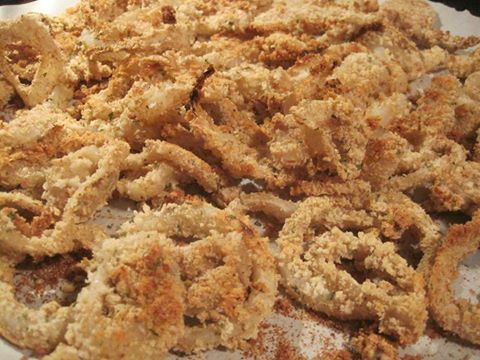 Dredge the onion pieces through the batter until well coated, then dip in the Breadcrumbs and place on parchment paper loosely. Bake at 420 degrees for 20-30 min. turning once until golden brown and crunchy. If you have an air fryer, these are EXCELLENT in the air fryer for about 17 min, shaking once. We enjoyed with Ketchup, but the possibilities are endless. *if you like a little heat, add 2T tabasco or other hot sauce to your batter.